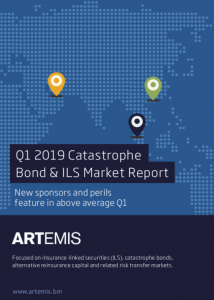 ARTEMIS covers cat bonds, insurance-linked securities (ILS), alternative reinsurance capital, risk transfer, investments, longevity and weather risk markets. Read more about Artemis. Or if you are new to this? Find 580+ ILS transactions in our catastrophe bond & insurance-linked securities Deal Directory. Join us on July 11th 2019 at our fourth annual insurance-linked securities (ILS) conference for the Asia and Pacific region, where experienced ILS practitioners can meet, discuss and network with regional investment, insurance and reinsurance executives. At $2.8 billion, catastrophe bond and ILS issuance was the second most active Q1 in the market’s history, in terms of deal volume. The outstanding market size at the end of the first-quarter of 2019 hit $37.9 billion, an increase from the end of the prior year. Download the report here. Read our reporting, insight and analysis of the main reinsurance renewals, when a large proportion of global reinsurance program terms are renewed and repriced. Reinsurance rates have responded to recent catastrophe losses, but ongoing pressure from the weight of reinsurance capital moderated rises. Read our reinsurance renewal coverage here. The Index tracks the performance of the insurance-linked securities (ILS) fund market. Statistics and data to analyse the catastrophe bond and related ILS market. Contact details of people working in the ILS or cat bond market and related areas of reinsurance. This index tracks the performance of a diversified portfolio of peak peril ILWs. Subscribe to Artemis' regular email newsletters. 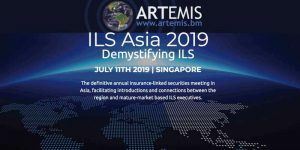 Held in Singapore, this is Artemis' fourth annual insurance-linked securities (ILS) conference for the Asia and Pacific region, bringing experienced ILS practitioners to meet, discuss and network with regional insurance, reinsurance and investment executives. Tickets on sale now, register today! Want to feature your event here? Contact us. New to ILS, cat bonds and insurance linked investments? As the asset class covering insurance linked securities and reinsurance linked investments grows, new readers may be looking for simple explanations of some of the key topics Artemis covers. What do we mean by traditional, non-traditional or alternative reinsurance? What are industry loss warranties?